I’m just back from ten days in beautiful Portugal (much more on that later – so many blog in my head!). There’s nothing like a holiday to make you realise how much you overlook at home. I’ve said it before, but, despite constantly being on the lookout for new bars, restaurants and shops in Bristol, there’s plenty I think about doing and just simply don’t get round to. When you’re on holiday, you want to cram in everything that sounds of interest, because who knows when you’ll be back. Why don’t we apply the same principle at home, especially to temporary exhibitions? So our new resolution is to act more like tourists our my own city. Whether it’s stopping for a rest on a bench by the harbourside to watch the world go by, treating ourselves to a spontaneous drink ‘just because’, going on road trips to nearby towns and countryside, or making sure we actually go to the things we say sound interesting (well, money permitting that is!). 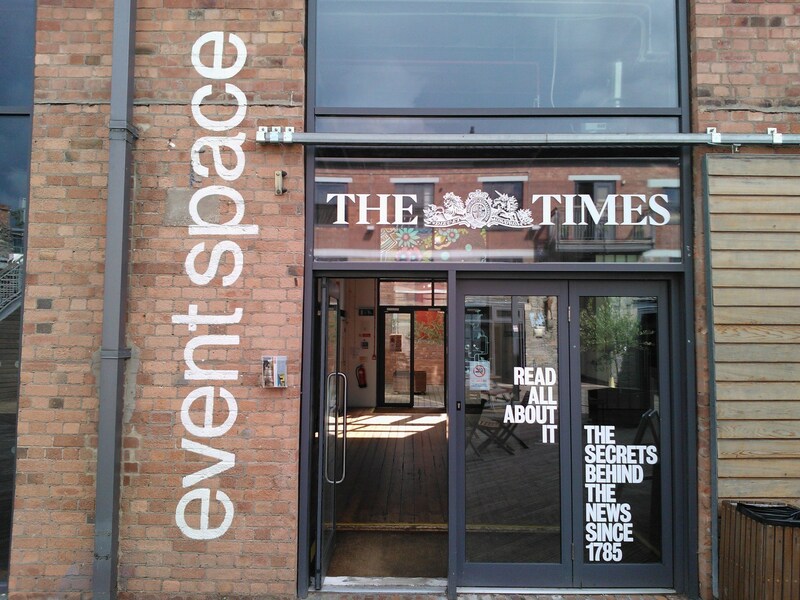 So a day after getting back and still in holiday/resolution mode, we popped down the road to visit Read All About It, The Times‘ ‘Newseum’ exhibition currently in the Paintworks’ event space. 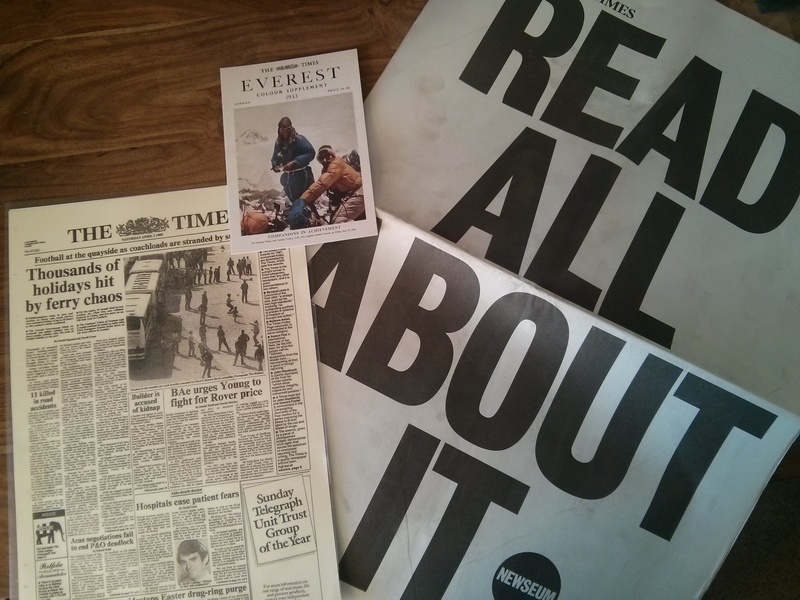 The exhibition explores The Times’ archives and the delivery of news from 1785 to the present. It has displays on key events such as war, photographing Everest and the expedition to climb it, and JFK’s assassination, and features artifacts such as original copy submitted, typewriters, Dictaphones and notebooks. There’s information on codes used for some stories and five animations that compliment the displays. And the photography on display is incredible, too. 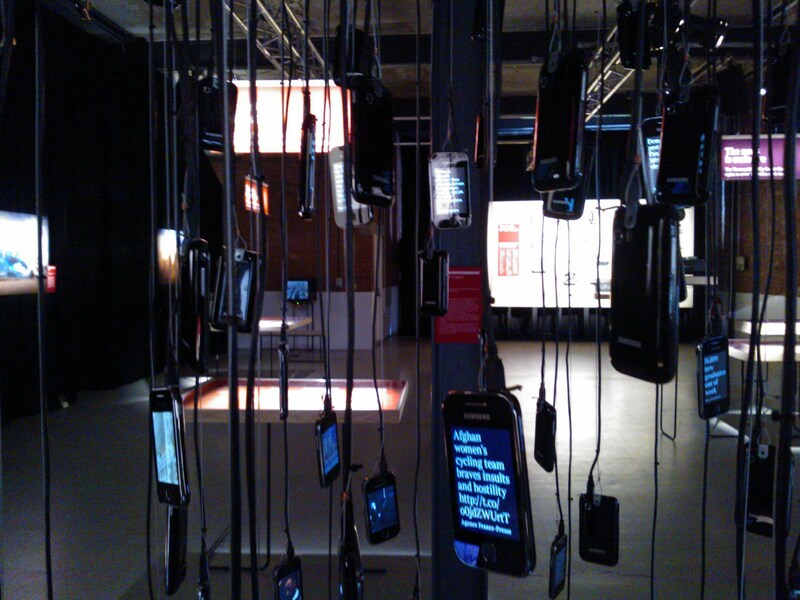 In the centre, there’s also a display of smartphones constantly updating with news from outlets such as Reuters and ATP. When seen next to the rest of the exhibition, it really is amazing how immediately we can get information now – and how much of it there is out there. You can also print off the front page of The Times from a day of your choosing – we went for our birthdays (though realised later that we should have gone for the day after to get the news from our actual birthdays. Oops!). Though if you choose a date before 1965 (I think? Some time about then), the front page will just show notices and advertisements – imagine that selling a paper today! Although very interesting (and free! ), the exhibition is quite small, taking 30-45 minutes or so to get around. It’s also, as you’d expect, Times-centric, concentrating on how they delivered the news and big stories for them and so it’s certainly not a comprehensive discussion on the evolution of news delivery. For example, I don’t think I saw a single mention of blogging or Tweeting, even though there are probably some comparisons to be made (for example, one correspondent in the ’80s got travellers to deliver censored information – I suppose travellers blogging and tweeting about countries they go to, things they’ve seen from places where news, and certainly uncensored news, isn’t so forthcoming might be today’s equivalent?). As such, although interesting, the exhibition’s probably not worth a special trip from too far away unless you’ve got an interest in journalism, or the history of the news. That said, that does kind of contradict my new ‘go and see something if you think it sounds interesting’ mentality, so if you like the sound of it ignore me and go! And it’s absolutely worth popping into if you’re in the area. Alternatively, you could make it into a bit of a day trip and combine the exhibition with a drink in Bocabar upstairs, a wander round Arnos Vale or a visit to some of the many other lovely places in nearby Totterdown/Knowle. Overall, if you overlook the Times-promoting-y/probable data gathering-ness, this is an interesting exhibition. A few gaps as you’d expect but worth your time if in the area or you’re interested in the subject area.